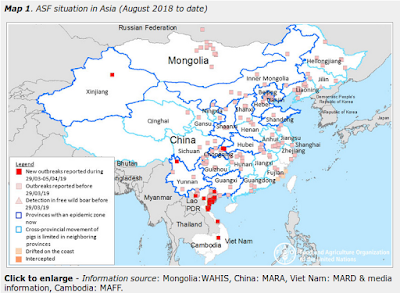 Although it has yet to have as big of impact as avian H7N9, the recently (2014) emerged H5N6 virus - a close cousin to H5N1 - has garnered a good deal of concern as it has infected a handful of humans as it has spread out of China and Laos into Vietnam. The extensive migration routes of wild birds may contribute to the geographic spread of H5N6 AIVs and pose a risk to humans and susceptible domesticated animals, and the H5N6 AIVs may spread from southern China to northern China by wild birds. Additional surveillance is required to better understand the threat of zoonotic transmission of AIVs. On Tuesday, in Guangdong Province: Human H5N6 Case In Critical Condition, we looked at the reported infection of a 26 year old woman in Shenzhen. Today we learn of a second case, this time in Zhaoqing, some 200 km northwest of Shenzhen. Guangdong Province, being a close trading partner with Hong Kong, has generally been more willing to share information on novel flu virus infections than many of the other Chinese provinces. This is the third novel flu infection reported by them in a week (1 H7N9, 2 H5N6). The Centre for Health Protection (CHP) of the Department of Health (DH) has been notified of a confirmed human case of avian influenza A(H5N6) by the Health and Family Planning Commission of Guangdong Province today (January 1) affecting a 40-year-old woman in Zhaoqing. The patient is currently hospitalised for treatment and in a critical condition.